This small stone building on King Street West was the Portsmouth Town Hall. It was designed by architect William Coverdale and constructed in 1865 as one of his last projects. Aberdeen Park, which now surrounds the building, was once a marshy extension of the bay across the street. This marsh was slowly filled in through the later nineteenth century in order to create usable land. The building was an extremely important center for the village, as many social and political activities took place here, such as Council meetings, church groups, temperance meetings, political rallies and bazaars. 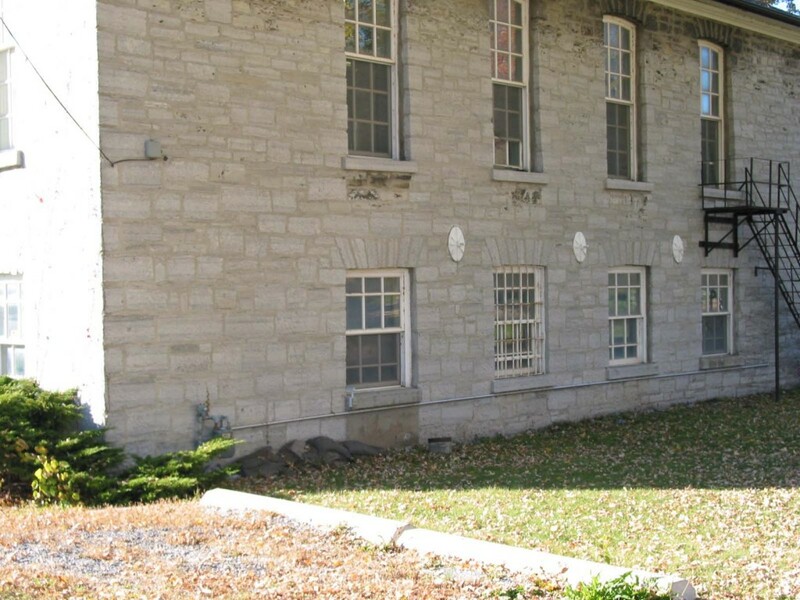 The Town Hall was even used by the local militia, as a drill hall and armoury and it included a village gaol consisting of two cells with windows that looked up the hill toward the penitentiary. Today, one barred window remains. When the Penitentiary was built, the village of Portsmouth was considered “separate and away” from the town of Kingston. There was a geographic distinction between Portsmouth and Kingston that does not exist today. Portsmouth was incorporated as a village in 1858, however almost a century later on January 1st, 1952 Portsmouth was annexed to the city of Kingston although the locals still refer to the area as ‘Portsmouth Village’. The penitentiary had a large impact on the village of Portsmouth. Under the Rules & Regulations of the prison, employees were required to live within sound of the prison bell in case of emergency. This, coupled with the sailing and boat-building community which took advantage of the protected harbour, helped to create a unique neighbourhood. Today, the urban sprawl of Kingston has enveloped Portsmouth and the penitentiary, and this small village has become well integrated into the city.